What do you name a dog who survives more close calls and narrow escapes than a superhero? 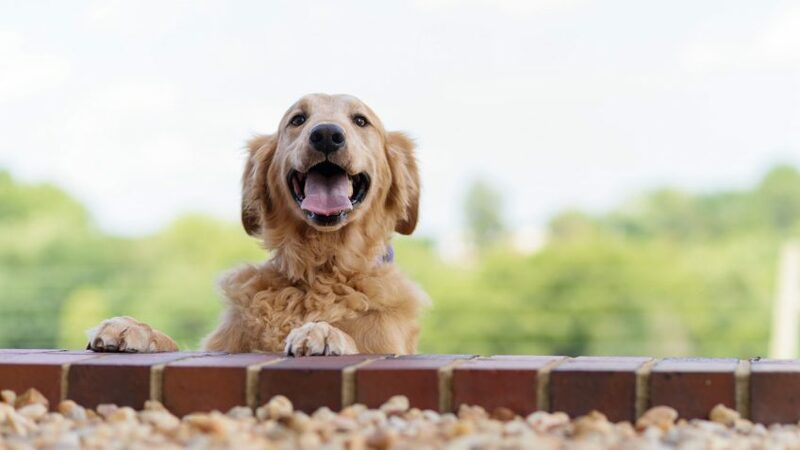 The fortuitously named 8-year-old golden retriever belongs to Carl Jewett of Nashville, N.C. His close shaves date back to puppyhood, when he was in the Ashe County dog pound. Things looked bleak, but just one day before he was due to be put down, he was adopted by Jewett. And that was just the first in a series of cliffhangers. “He’s a true retriever,” Jewett says. “He can’t stay out of the water.” But Lucky is also mild-mannered and sweet-tempered, according to his owner. “I’ve had lots of dogs, and he’s one of the best I’ve ever had,” Jewett adds. Life in Lucky’s world was fine until last December when he developed lameness in his right hind leg. By early January, he had a noticeable mass over his knee. Initial examinations by private veterinarians indicated a possible osteosarcoma: bone cancer. Examinations found that the cancer had not spread, and in February he was evaluated for amputation — a frequent part of osteosarcoma treatment — at Coats Veterinary Hospital in Rocky Mount. That’s when another stroke of luck came into play. 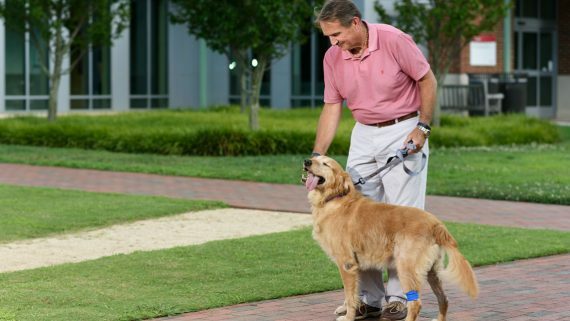 When immediate amputation was deemed unnecessary, Lucky was referred to the NC State College of Veterinary Medicine for enrollment in a clinical trial of chemotherapy drugs. An alternative therapy would be investigated first, but enrollment in the clinical trial was just the first plot twist in this story. Once he was at NC State, the first step — a routine one — was taking a tissue sample by drawing fluid from the bone mass on Lucky’s knee and perform a diagnostic evaluation on the cells.The result was anything but routine. Lucky did not have an osteosarcoma, so the clinical trial no longer made sense. Tests revealed that Lucky has an extremely rare large-cell lymphoma of the bone called osseous lymphoma. 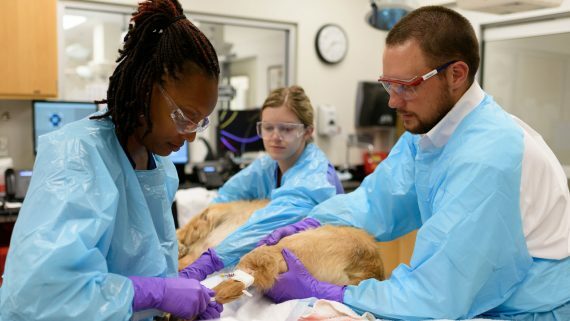 The case was referred to NC State’s medical oncology service, where medical oncology resident Carly Stevens and Joanne Intile, clinical assistant professor of medical oncology, took over Lucky’s care. Not only was Lucky’s form of cancer rare, but the fact that it had not spread beyond its original site was quite fortunate. Also importantly, there was no sign of a bone fracture resulting from the cancerous mass. Had there been one, amputation would have been unavoidable. But his good fortune didn’t end there. Because of his rare condition, Lucky qualified to have his care subsidized through a very generous grant from the Petco Foundation. 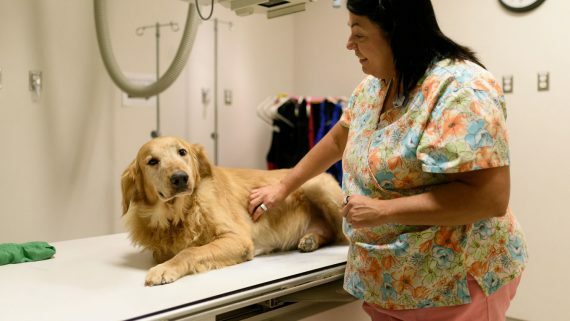 The Petco Foundation is helping pets fight cancer by defraying the cost of treating rare cancers and helping medical professionals research innovative and effective therapies for conditions that are not often seen or treated, conditions like Lucky’s. The result is not only valuable learning but healthier and happier pets and pet owners. Lucky’s status made it possible to pursue treatment involving radiation and chemotherapy similar to human patients and his response to treatment has been excellent. His lameness is gone, there is no sign of a bone fracture and he is tolerating chemotherapy well. Jewett reports that Lucky is his usual self, running and playing easily and happily. He even seems to enjoy the long car rides from Nashville to Raleigh for his treatments, looking out the window and taking in the scenery. On a follow-up visit at the end of June, the news was all positive. Stevens says that when he was first diagnosed, a large number of lymphoma cells were collected. At this visit, no lymphoma cells were detected. While there is no perfect way to assess Lucky’s remission status, collectively the exam findings and tests were consistent with complete remission,” she says. Even a superhero needs a helping hand now and then.